Want to skip to the results? View the Gripped website HERE. We’ve worked on over 10 projects with Gripped over the past year, but when Co-Founder Steve Eveleigh approached spoke with us about building their own business site, we were extremely delighted. Gripped is an inbound marketing agency, who specialise in orchestrating and executing B2B SaaS and technology companies go-to-market strategies. The team has a breadth of inbound marketing knowledge and experienced formed from long and varied marketing careers. Their business has grown extremely rapidly since launching in Q3 2017, and their website has been a key player in this. The team at Gripped & Affios have worked together for many years at different businesses, so we know exactly what each other’s strengths and weaknesses are. 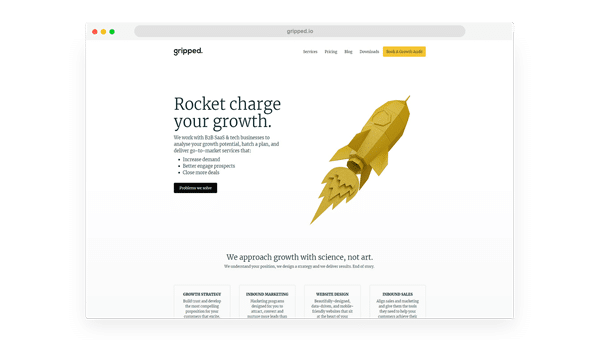 Gripped brought their marketing plan, content strategy and user journey to a workshop session with us, and we provided the clean design and scalable back-end structure that’s complimented their marketing efforts over the past year. For the past year, Gripped’s website has been used to funnel countless leads through the pipeline and into customers. It’s crucial to have a website in place that carries the best practices of inbound marketing, so that when your marketing efforts drive prospects, your website is there to convert them. Since the site launch, we’ve worked on over 10 more website builds in partnership with Gripped. To view the Gripped website, just click HERE. Founder @ Affios - I'm here to help you solve your queries around WordPress, HubSpot, SEO & digital marketing in general! Ready to go? Just hit the button below. It's time to boost your business with a conversion ready website from Affios. © 2019 Affios Ltd. All Rights Reserved.